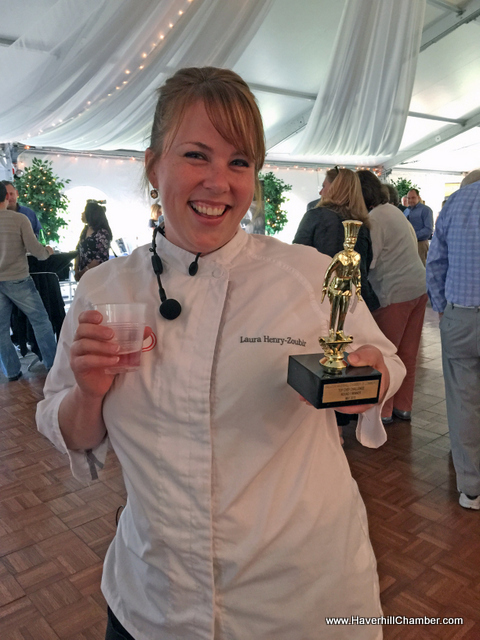 Chef Laura Henry-Zoubir, Development Chef, Joseph’s Gourmet Pasta was the winner of the “Round One” Competition. The Greater Haverhill Chamber of Commerce is excited to announce the 2nd in a trio of events featuring the area’s best culinary minds. Round 2 of the “Top Chef Challenge: The Best of Greater Haverhill’s Chefs, Food, Wine, Beer & More…” will bring three new chefs into the spotlight, and introduce entrees and main dishes worthy of a five star dining experience. This next event will take place on Thursday, October 22, 2015 at Merrimack Valley Golf Club, 210 Howe Street, Methuen. As before, this round will feature live cooking demonstrations with three renowned local chefs, voting by a panel of judges & the audience, wine & beer tasting and an array of stationary and passed hors d’oeuvres stations. Sure to be an even BIGGER hit than Round One, with both foodies and non-foodies alike the audience will have a chance to vote for their favorite presentation in the Main Dish / Entrée category. Competing in this challenge so far are Chef Rob Ozoonian, Executive Chef, Joseph’s Trattoria in Ward Hill; and Anna Jabar-Omoyeni, Development Chef for Simply Elegant Catering and Past Owner La Boniche Restaurant in Lowell. The audience is invited to arrive at 5:30 PM and will be entertained by the cooking demonstrations of each chef as they prepare their “entry” from the stage. Demonstration will also be videoed and streamed live on screen at the event for maximum visibility. Wine and Beer tasting stations will be open throughout the event, and completed Chef Selections will be presented to the audience for judging. Desserts at this event are being sponsored by Align Credit Union. Tickets are $50 each and include the beer and wine tasting, stationary and passed hors d’oeuvres selection, and entry to the live cooking show. A cash bar will also be available. For ticket reservation contact the Chamber office at 978-373-5663 or info@haverhillchamber.com. For additional information please visit the website at www.haverhillchamber.com. Rob Ozoonian: Robert graduated from Johnson and Wales College in 1984 with his degree in culinary arts. He has since worked for Caesar’s Hotel in Lake Tahoe, corporate hotels, including, Marriott, Hilton, and Sheraton, as well as Odyssey Cruises of Boston. Robert has worked in the industry for 25 years. His latest endeavor is Executive Chef at Joseph’s Trattoria and Bakery. His staff of 20 perfect Tuscan Italian cuisine only to be rivaled by the Italian Kitchens of Tuscany themselves. Anna Jabar-Omoyeni: In November 2014, after 26 years, Chef Anna Jabar-Omoyeni closed the doors of her upscale French Bistro and Wine Bar, La Boniche in downtown Lowell. Anna now works as a consultant to area restaurateurs providing expertise in Menu and recipe development, interior design as and kitchen / dining room layout. She recently accepted a position with Simply Elegant Catering, where she will act as Development Chef.